This is the third installment of the three-part series giving you some ideas about what to eat for breakfast, lunch and dinner. So, for dinner, the same basic principles apply as for lunch. You should eat a generous portion of meat, fish or chicken – or if you are vegetarian you can have a good portion of vegetarian protein such as beans, eggs etc. I’m not for or against being a vegetarian – but I don’t believe eating meat, fish and chicken in moderation will do any harm at all, and in fact is better for your health than a restricted vegetarian diet. I want to stress here that I am not advocating a high protein or low-carb diet. I believe in a balanced diet with all meals containing protein, fasts/oils and carbohydrates. Now, I know some people disagree with me. In fact, since I have sent my breakfast and lunch recommendations over the last couple of days, I’ve had some fairly strongly worded replies from people who believe in low-carb or vegan raw food diets, or similar. Quite a few people have unsubscribed from my list in disgust at the fact that I recommend eating butter on bread. 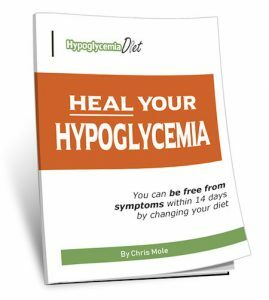 On the positive side, I’ve had a huge amount of emails thanking me – and many people have shared personal testimonials of how my diet has helped them recover from hypoglycemia. In fact, I have yet to hear from anyone who has given my diet a fair trial and has not benefited. All the critics reject it, based on what they have read from other “experts” – without even giving it a fair trial. Anyway, back to dinner. You should have generous serving of vegetables, whatever is in season. In summer, salads are ideal but in winter it’s better to eat cooked vegetables because you need warmer food in winter. Then you need some carbohydrate. My favorite is mashed potatoes. Cook the potatoes until soft and mash them with butter and a little milk. Mashed potatoes are great because they digest slowly and give you a steady release of energy over a few hours. I always like to put a bit of butter on potatoes (if they are not mashed) for the same reason, it slows down the digestion and avoids a dip in blood sugar. There’s nothing wrong with pasta or rice, as part of a meal. You’ll see some experts who advise against pasta and rice because they do release sugar quite quickly and have a relatively high glycemic index. But the thing to remember is, you are not sitting down to just a plate of pasta or rice, and nothing else. Certainly, if you eat a bowl of white rice or pasta on their own, you’ll get low blood sugar soon afterwards. But if you eat a balanced meal of meat, fish or chicken, vegetables and pasta with some olive oil on it, that’s a balanced meal and the overall glycemic index of the whole meal is quite low. Eat the kind of meals that suit your nationality and ethnic group. Pretty much all traditional ethnic meals are healthy. Now, you’ll be wondering about dessert. Well, you should avoid dessert generally -but you might be able to have fruit, or fruit salad with cream, without any ill effects. The other dessert that I enjoy is cheesecake, which generally has only a small amount of sugar and digests slowly. Just a small serving, of course. Over-eating in general is bad for your health – even over-eating of “health foods”. So don’t think just because you are eating healthy foods that you can eat all you want. 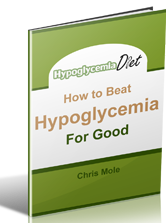 Over eating overworks the liver and that is a factor in hypoglycemia. This is just a basic overview. I’m going to go into much more detail in my new book, which I hope to have published in January. If you’ve read my current book, you’ll see that I don’t recommend a bedtime snack (as a general rule). If you eat an adequate dinner between 6pm and 7pm (or a bit later, but at least 3 hours before bedtime) then you won’t need a snack and you will sleep a lot better. I am new to the hypoglycemia thing. I had a super low back on Friday, and am still feeling the effects of it, so wanted some “eating” advice. Thank you for your information. When I crave that butter in the morning on my slice of whole wheat toast, I will be eating it from now on, and not listening to the “experts” about low fat diets. I have been on a low fat, low sodium diet since my heart attack in 2012. Although I have lost 50 pounds and feel good about being a size 12, I am starting to feel terrible because I believe I have hypoglycemia. I was told this when I was a child, but didn’t think anything of it till now. I hope to find more information on the blogs. Thanks again for sharing, and being honest about what to eat, and making my brain not worry so much about having a piece of meat or some oil, or even a little butter. I did not realize that it actually “helps”. Thanks so much for sharing. You can definitely eat some fat in your diet and it will be a huge help with preventing hypoglycemia. So many people have experienced the same thing. Add a little butter on your bread or toast, and see how much more satisfying it is, and how much more sustained energy it gives you, without a sugar crash. Help me understand, to those who know this best, would a healthy Energizing “bar” made from only 6 organic ingredients, that comes in a Bar-In-The-Jar form be helpful? please take a look at this bar: https://www.kickstarter.com/projects/1647268003/chocomondzel-the-perfect-energy-bar-in-the-jar-at . I was contacted by a Type 2 diabetic, on wheelchair, indicating this would be great for her because she could eat on the go as much as she feels necessary, and close the jar back into her backpack. So I developed a modified recipe for her without the pretzel (less carbs) and substituted with Hazelnut for more protein… Please educate me on weather or not this product is interesting for you, and if so please forward to your community, because I would love to productize it for you. I am hypoglycemic and need to lose weight at least 15 lbs. I am wondering how I can lose weight at the same time eating those extra carbs as you have mentioned. I do know about the added butter on bread etc. to slow down the digestion. If you need to lose weight, eat fewer carbs. We are all different. I’ve listed the amounts that I eat as a male who is 6’2″ tall and weighs 160lb – but if you are overweight, eat fewer carbs – or no carbs if you want to be really radical and follow a ketogenic diet to get the weight off. But I don’t recommend that over the long term. Hi I have been on a fat free diet for many years owing to cholesterol, but over the past few years on and off I have most of the symptoms of Hypoglycaemia , but the worst feeling I get is hunger and no mater how much I eat I get no satisfaction can you advise please . A fat-free diet is not good for everyone. Some people can do well with low fat, but others need to eat more fat. It is just a different metabolism. We are not all the same. I recommend you eat a moderate amount of good fats, such as butter and other dairy products, or other fats such as avocado or coconut cream, nuts etc. By eating more fats in your diet, you will slow down the digestion of carbohydrates and give you a more steady release of energy over several hours.